What better way to end the year than by learning about the best SEO and SEM strategies for local searches? Imagine getting a head start on better focusing your marketing and advertising strategy for 2015 while spending a few days in San Francisco. Our CEO, Bernadette Coleman, will be speaking at the LEADING IN LOCAL: Interactive Media Conference along with several advertising/marketing agencies, local media suppliers, financial analysts and hundreds of other leaders in interactive local media. Her speech, entitled “Getting Ahead with Local Search, 2015,” will give you an exclusive, inside view to our forecast for getting ahead in local in 2015. Mark your calendar for December 3-5 and get ready to learn more about the most effective “buy” for local businesses. The LEADING IN LOCAL: Interactive Local Media conference seeks to plot a course on the future of interactive local media, local search and locally targeted advertising. Before your business goes national or even international, it’s best that you tap into as many local resources as possible, which means knowing how to reach out to consumers in the local community who can benefit from your products or services. Even if your current media channels and advertising/marketing campaigns are effective, the next big, unexpected change could be just around the corner. 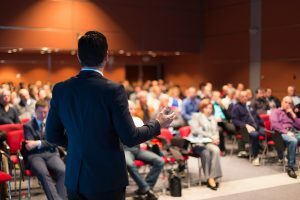 Rather than playing catch up, you can remain ahead of the game and the curve by taking three days to learn from numerous speakers and sessions. There will also be plenty of opportunities for you to network and speak with executive-level decision makers from all over the world. On Friday, December 5, our very own Bernadette will be discussing the most important and useful features of the best SEM and SEO strategies, so be sure to arrive early at the Grand Peninsula Ballroom of the Hyatt Regency San Francisco Airport, as her presentation begins at 8:30 a.m. To save $200 on the conference, simply use the code “ILMSPEAKER” when you sign up. Don’t hesitate to reach out to us for more information or details. We look forward to seeing you there and helping you give your locally targeted advertising and marketing campaign a professional upgrade.